Specifically binds to MDA-LDL and other MDA modified proteins. Dilution for immunoblot and ELISA range: 200 to 20,000. Polyclonal antibody purified by MDA modified protein- Sepharose affinity column. 75 mM PBS, 75 mM NaCl, 1 mM EDTA, 0.02% NaN3, pH 7.2. -20 degree C for long-term storage, 4 degree C for short-term storage. Aliquot to avoid repeated thaw and freeze. Small volumes of anti-MDA antibody vial(s) may occasionally become entrapped in the seal of the product vial during shipment and storage. If necessary, briefly centrifuge the vial on a tabletop centrifuge to dislodge any liquid in the container`s cap. Certain products may require to ship with dry ice and additional dry ice fee may apply. Dilution for Immunoblot & ELISA range: 1,000 to 20,000. 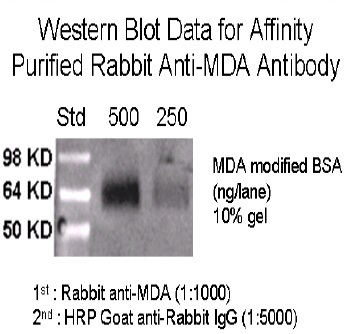 Use: The antibody can be used for detection of MDA in plasma, lipoproteins and other MDA modified proteins, immunoassays, immunoblots, enzyme conjugation, or biotinylation.